The second edition of the Anna Lindh Forum takes place from 4th to 7th April in the French city of Marseille, European capital of culture for 2013. 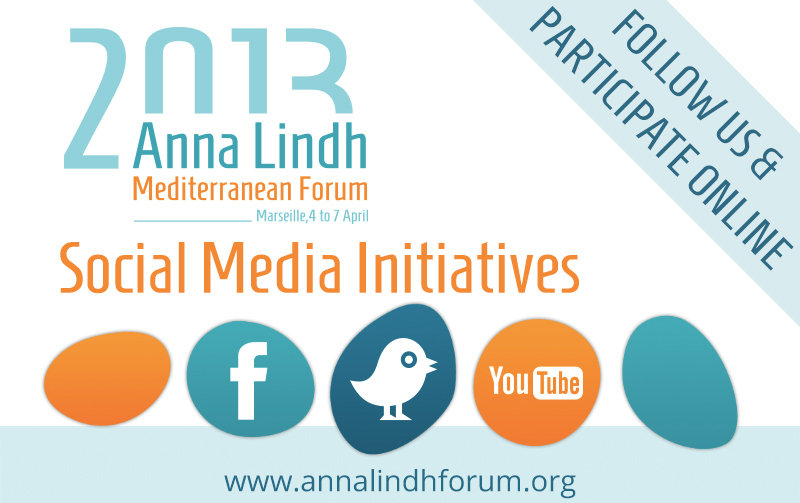 The Anna Lindh Mediterranean Forum is a unique gathering that brings together youth leaders and civil society organisations, in addition to influential policy-makers and intercultural experts from across the Euro-Mediterranean region. Convoked every three years by the Anna Lindh Foundation, its goal is to provide an innovative and participative space for debate, networking and good practice exchange on intercultural dialogue initiatives. Aiming at bringing citizens of the Euro-Med together, the 2013 Forum is launched under the slogan of “Citizens for the Mediterranean”, reflecting on the need for intercultural dialogue and cooperation to deal with challenges facing the region following historic Arab Awakening and the social impact of the economic crisis in Europe. In this new Mediterranean context, the Forum will be a landmark event for re-launching dialogue at the regional level. More specifically, the Forum will be an opportunity to address the major Trends, Tensions and Transitions facing the Euro-Mediterranean societies, and for adapting intercultural dialogue as a tool for civic participation. To get the latest updates from the Forum, search for the official hashtag #ALF2013 on Twitter and use it in all your posts. You can get involved in any of the sessions online by posting comments on the interactive online programme. The commenting system will then let you tweet or post your comment to Facebook and start the conversation. We may also feature your question to the panel on the day!